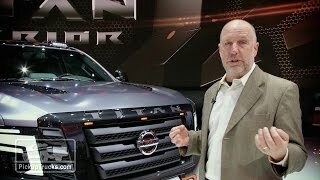 Nissan recently introduced its Titan XD to the automotive industry and here they are at the 2016 North American International Auto Show unveiling the Nissan Titan Warrior Concept 2016. The rogue truck carries lots of power beneath the hood and has some really great off-road features to rule your heart. 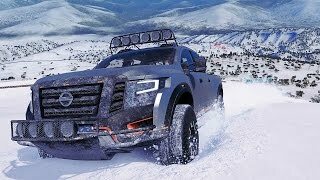 Let us have a look at the review of Nissan Titan Warrior Concept 2016 to know in detail about it. The interior of Nissan Titan Warrior Concept 2016 features the ascent of ‘Magma’ color throughout. The radiance includes the center mark on the steering wheel, center console, door panels, the backlighting, start/stop engine button and the stitching. Getting to the dashboard where we have the infotainment system with some new controls below it. The center console has a pair drink containers. While the one comes with heating function the other keeps drink cool. You can also notice carbon fiber work around the AC vents and the grab handles. Thus rounding up the interior details of Nissan Titan Warrior Concept 2016 I would say it is simple with basic amenities. 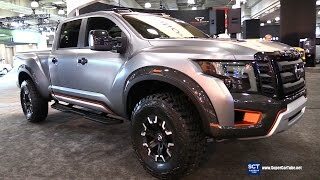 The exterior of Nissan Titan Warrior Concept 2016 is just amazing. They didn’t leave a single stone unturned in terms of better looks. Let us start with the front fascia where we have the bolder and aggressive front grille, keeping the traditional shape intact. The headlights get a brand new design with three marker lights in it and featuring a design that’s far more futuristic. Beneath this we have a sporting bumper with an undercarriage to make the off-road rides safer. Moving towards the side body we have larger fenders featuring carbon fiber accents and the beefy wheel arches covering the massive 37-inch tires. The rear end of the concept goes a lap ahead of all this and portrays four exhaust ports beneath while the tailgate has dark accents marking presence vertically. There’s also a carbon fiber spoiler and LED bulbs that give the model touch of sportiness. 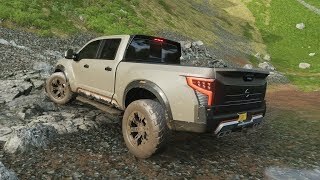 Thus rounding up the exterior details of Nissan Titan Warrior Concept 2016 I would say, it is futuristic and mesmerizing enough to tempt you to buy this truck. Beneath the hood of Nissan Titan Warrior Concept 2016 will be a 5.0 liter Cummins V8 turbo diesel generating total output of 310 hp and peak torque of 752 nm paired to six-speed automatic transmission. 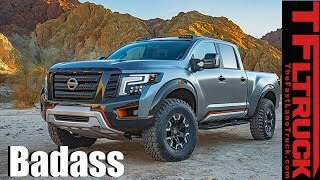 The performance figures of Nissan Titan Warrior Concept 2016 are still not shared but we expect them to be out a little before company shares the final production version of the model.